ONE OF INDIA’s foremost Kathak performers was the central attraction for many of those attending Darbar on Saturday evening – but she was almost upstaged the virtuoso Bharatanatyam dancer Mavin Khoo. He surely took the South Indian dance form to a new high – probably in a first for Sadler’s Wells, arguably the home of British dance in the UK. 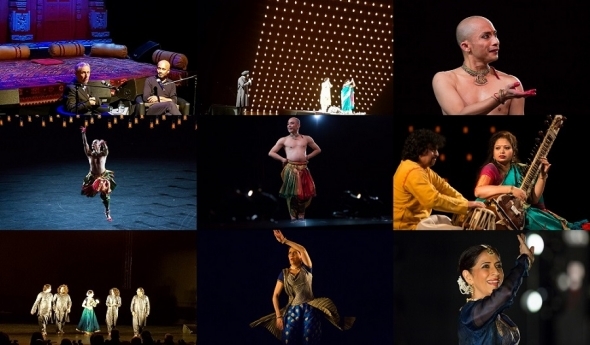 Earlier in the day, festivalgoers were also treated to Kathak supremo Akram Khan talking to Alistair Spalding, artistic director and CEO of Sadler’s Wells, about his curation of the dance featured in Darbar Festival – which for the first time has added dance to its customary Indian classical music repertoire. Khan also talked about his own process of creation and experimentation. He presented Thursday’s opening night ‘X’, a 20-minute or so R&D version of what will is expected to be his last full-length solo piece, ‘Xenos’ in May and part of the centenary commemorations of the end of the First World War, 14-18 Now. Mangaldas’ Kathak was something to behold – going through the full range of emotions and movements. There were three costume changes and each segment was slightly different in intensity and majesty. She is grace personified and while Khoo presents a more vivid and brimming style, Mangaldas illustrates the symmetry and circular philosophy Kathak more often represents. It was something Khan elaborated on his talk, explaining that Kathak was devoted to Lord Krishna and Bharatanatyam had more of relationship with Lord Shiva, but both forms are derived from the ancient Sanskrit text, ‘Natyashastra’, which is an exposition of the Indian classical performing arts as they were initially conceived (either some 200 years before the Common Era or after). Both Khoo and Mangaldas focus on a more secular interpretation – one which explores a common humanity and mode of expression and appeals to the Romantic anywhere. In between the two dances, Shahana Banerjee and Surpreet Deshpande kept the audience enthralled with sitar (on its own by Banerjee) and then accompanied with tabla from Deshpande. The first part of this may have been a little dry, Banerjee’s sitar is not one for rhetorical flourishes (if it can be said so) and is more traditional and classical. Paired however against Deshpande’s more energetic tabla, Banerjee came out of her traditional shell and the energy was greater. In his talk, Khan said it was important to keep alive the flame of Indian classical dance and music. He pointed out that it was hard for many dancers to make a living from just performing classical – most had to turn to contemporary because there was Arts Council funding and support for it. Darbar’s introduction of dance alongside its customary classical offerings was one way to keep that flame of tradition alive and provide inspiration for a new one, Khan suggested.